Today, we are speaking with Marco Ochoa, founder of Ecobrow, one of the small businesses that won the #QBBetterTogether contest, along with his accounting professional, Astrid Daniela Galvez, founder of Accounting Specialists and Business Solutions, LLC. As part of the contest, we asked small businesses and accounting professionals to tell us how they work together to achieve success. Read on to check out Marco and Astrid’s story, and take a look at Astrid’s profile. Shauna Maher: Welcome Marco and congratulations on winning the #QBBetterTogether contest! Let’s kick things off with a little background about your small business. 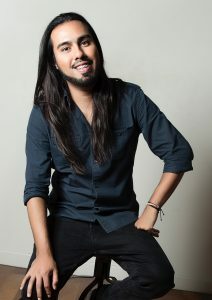 Marco Ochoa: I opened Ecobrow in 2011, an eyebrow shaping business in Los Angeles, Calif. We specialize in the art of threading, a hair removal technique that originated in China many years ago. I am also the creator of the Ecobrow Defining Wax, an eyebrow product featuring a unique formula that empowers women to create the perfect brow. SM: Why did you decide to hire an accountant for your business? MO: I wanted to grow as a company, but keeping track of my own finances started to become a little overwhelming. I wanted to focus on creating new products, meeting new vendors and traveling instead. Luckily, I knew Astrid of Accounting Specialists and Business Solutions and spoke to her about the matter. SM: How did you know Astrid was the perfect choice for Ecobrow? MO: I met Astrid through a mutual friend at social gatherings and knew immediately that she was the right person to hire for my bookkeeping needs. At the time, we were both just starting our own companies, and this shared experience made our interactions more comfortable and non-intimidating. Astrid is also very knowledgeable and keeps her financial management skills up to date. The fact that she is passionate about working with small companies like Ecobrow was a plus for me. SM: What would you say is the biggest benefit to partnering with Astrid? MO: Astrid helps with my daily bookkeeping, bill payment, management, payroll, tax issues and financial strategy. The biggest advantage in partnering up with her is that she is always willing to listen and learn, even when it doesn’t involve her industry. She’s been a huge part of my success as a company. SM: What apps do you currently use in your business? MO: QuickBooks® Online has been a breeze to use for creating invoices and registering new customers. I love that I can travel and still keep track of my books. We also use Bill.com and Gusto, and are also currently searching for an inventory app. SM: What do you think is the key to having a successful working relationship with your accounting professional? MO: To me, trust is the most important factor when working with others – not just your accountant or bookkeeper, but anyone else you decide to do business with as well. SM: What is one of the biggest challenges you and Astrid faced together in your business? MO: In 2015, I launched my Ecobrow Defining Wax product in 300 popular retail stores nationwide. It was a huge opportunity for me and my company, but it also came with so much financial stress. I am so thankful Astrid was there to help me with these challenges. She was a key part of the communication process with the stores, and she was invaluable in assisting me with financial planning and accounts receivable management. SM: What has been the best piece of advice from Astrid? MO: To always believe in yourself. No dream is ever too big. SM: Why would you recommend that other small businesses get an accountant/bookkeeper? MO: Having an accountant or bookkeeper will make their lives so much easier. Not having to worry about the financial part of my business has inspired me to create more and really use my time for the things that truly make me happy.